After a game of hoops, oftentimes facilities need to make space for another event. Telescopic gymnasium bleachers offer the best of both worlds. When your facility needs to open up your space for another sporting event, your bleacher system can retract into a compact storage position, maximizing the facility floor space. All rows move at once to a closed position and provide either a flat fold front or closed back, increasing usable floor space. If you would like more information about the telescopic basketball bleachers from Toadvine Enterprises, contact us today and let us know how we can help. The practical design and flexibility of the telescopic bleacher system has been used by spectators and fans for more than 70 years. Telescopic bleachers are still a very popular choice in many arenas today. Each telescopic bleacher project is custom made and adapted to the dimensions available in your indoor facility. Mainly used in indoor facilities to increase seating capacity, the mobile telescopic seating product adds a series of bleacher modules that can be folded to occupy very little space when not being used. The mobile bleacher system is one of the most flexible seating systems available to schools and sporting facilities and is commonly used to accommodate a variety of needs. Mobile bleacher systems can be used in one part of the building and then transported and stored in a different part of the building. This style of seating can run up to 21" wide with seating capabilities of 14 rows at a 10 1/4 inch rise or 12 rows with an 11 1/2 inch rise. These independent, self-supporting units do not require anchorage to the wall or floor. Used commonly in gymnasiums, music rooms, cafeterias and class rooms, these bleachers provide easy manual operation. A portable hydraulic dolly is required and generally provided to transport units to and from spectator and storage areas and a pair of hydraulic trucks are required to move the mobile units. Back handles and back rails are required by code and for safety purposes. With a standard height of 8" the back panel provides a flat wall type surface to discourage access to the understructure of the bleachers. All of these features make the mobile telescopic bleacher a very flexible and independent choice in seating. When your facility demands a quick transformation from a wide open space to a fully functioning spectator arena, consider the benefits of the mobile telescopic bleacher system. For more information on how Toadvine Enterprises can meet your seating needs, fill out our form to the right and receive a free quote from one of our seating professionals. Fans and spectators have been utilizing telescopic bleachers for their seating choice in facilities and gymnasiums for more than 70 years. The practical design and flexibility of this seating has kept the telescopic bleacher a popular choice in many arenas. Each telescopic bleacher project is custom made, adapted to the dimensions available in the indoor facility. Mainly used in indoor facilities to increase seating capacity, this product adds a series of bleacher modules that can be folded to occupy very little space when not being used. 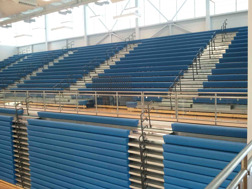 As the top provider of telescopic bleachers for more than 30 years, Toadvine Enterprises offers several different types of telescopic bleacher seating that will meet the needs of your facility with a quality product and exceptional customer service. Here are the different varieties of telescopic bleachers we offer and a description of how they might benefit your organization. Reverse Fold Systems. This type of telescopic bleacher is designed to utilize the space behind the bleacher stack for other activities when the bleacher is not in use. These systems are recommended to have up to 18 rows. Forward Fold. The most common telescopic seating system is the forward fold bleachers which open in the forward direction. These systems are available in up to 24 rows. Recessed Systems. The best feature of the recessed bleacher system is the fact that they require minimal clearance for a nice comfortable fit under a balcony overhang. This type of system is helpful when you wish to utilize floor space when the bleachers are stacked away. Mobile Systems. The advantage of using the mobile system is that they can be used in one part of a building and then transported and stored in another. Portable hydraulic dollies are provided with the system. These systems are available with up to 14 rows. Free-Standing Floor-Attached Systems. 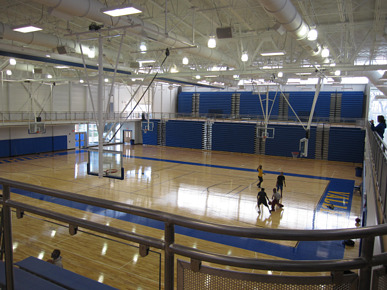 When bleachers are required to stand away from the wall, or when the facility restricts wall attachment, these bleachers are ideal. Contact us for details on row restrictions. Contact Toadvine Enterprises today to find out what telescopic bleacher system is best for your facility.